If you're joining us for the first time, on a visit from the Papercraft Inspirations Christmas Issue-celebrations and blog party, then a special 'hello new comer' to you too! 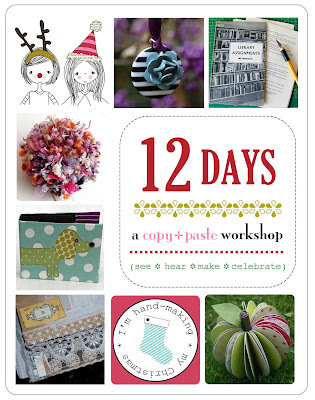 As our Christmas post earlier in the week contained a sneaky hint so now we’re back to spill the festive beans: We’re very happy to announce we're re-running our online workshop - 12 Days :: A Copy+Paste Christmas in a brand new blog for 2010. If you took the class last time around, you're more than welcome to join in once again this year, we'll be sending out an email to you soon with the new log-in details. It'd be great to see you. This year the class will run between 4th and 19th November and is packed with projects, downloads and tutorials designed to help you make the most of your creative supplies in the run up to Christmas. What's even better is that we’ve designed each of the main projects, and many of the additional ones, to be adaptable, which means that, instead of turning into giant crafty pumpkins the minute Boxing Day arrives, they’re just as relevant at other times of year. Each one is available as a downloadable PDF, so you can print and refer to it whenever you want. :: The cost is £20 and payment is via the PayPal button at the top right of this blog. :: You don’t need an account to pay this way – just a credit or debit card. :: Or we can alternatively arrange to accept cheques. Please email thecopyandpasteproject@googlemail.com for more details if you require this option. :: Once you’ve purchased your class pass, we’ll send you an email with details of the private 12Days blog. :: You’ll then be able to log in, have a look around, say hello to your fellow students and keep an eye out for a few pre-class surprises. Once again, the content is the same as the class we ran last year but will be hosted on a brand new blog with live daily posts between the 4th and 19th November. :: If you took the class last year, you can still access the 2009 blog, and we'll also be offering a brand new workshop in the new year! Oh yay! I took the workshop and found it hugely enjoyable and loved making the projects. So if you're reading this and thinking about taking the workshop, I'd say go for it! looks like a great workshop-yay! Oh, this looks fun, and I'd love to be kept in the loop about the new class in 2011 too! This looks like a lot of fun so I've just signed up and blogged about it too! This will be my first ever e-course so really looking forward to seeing how it all works.